About the Old North Trail…. There is a well known trail we call the Old North Trail. It runs north and south along the Rocky Mountains. No one knows how long it has been used by the Indians. My father told me it originated in the migration of a great tribe of Indians from the distant north to the south, and all the tribes have, ever since, continued to follow in their tracks. The Old North Trail is now becoming overgrown with moss and grass but it was worn so deeply, by many generations of travelers, that the travois tracks and horse trail are still plainly visible. “On Crow Lodge River, just across from our present camp, a lone pine tree once stood. It was a landmark for people traveling north and south along the Old North Trail, because it stood upon the plain and could be seen from a long distance. Finally the Lone Tree fell, but two children took its place. They have grown large and now they mark the former course of the North Trail. The Indians still speak of the spot as the Lone Tree. In many places the white man’s roads and towns have obliterated the Old Trail. It forked where the city of Calgary now stands. The right fork ran north into the Barren Lands as far as people live. The main trail ran south along the eastern side of the Rockies, at a uniform distance from the mountains, keeping clear of the forest, and outside of the foothills. It ran close to where the city of Helena now stands, and extended south into the country, inhabited by a people with dark skins, and long hair falling over their faces (Mexico). In former times, when the Indian tribes were at war, there was constant fighting along the North Trail. In those days, Indians, who wanted to travel in peace, avoided it and took to the forest. My father once told me of an expedition from the Blackfeet, that went south by the Old Trail, to visit the people with dark skins. Elk Tongue and his wife, Natoya, were of this expedition, also Arrow Top and Pemmican, who was a boy of twelve at that time. He died only a few years ago at the age of 95. They were absent four years. It took them twelve moons of steady traveling to reach the country of the dark skinned people, and eighteen moons to come north again. They returned by a longer route through the ‘ High Trees ‘ or Bitter Root country, where they could travel without danger of being seen. 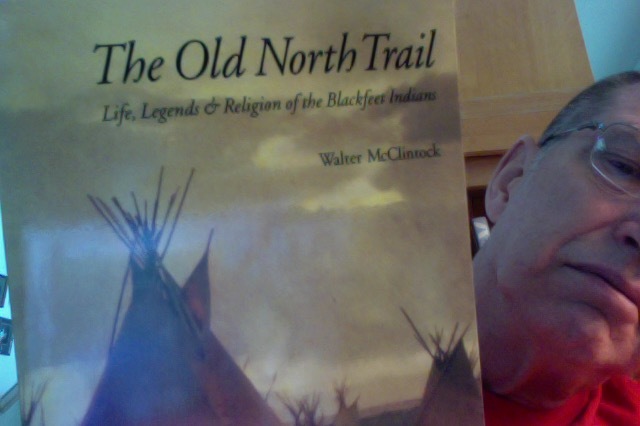 They feared going along the North Trail because it was frequented by their enemies, the Crows, Sioux, and Cheyennes. Elk Tongue brought back the Dancing Pipe. He bought it nearly one hundred years ago and it was then very old. The South Man, who gave it to him, warned him to use it only upon important occasions, for the fulfillment of a vow, or the recovery of the sick. Whenever anyone was starting on a war, or hunting expedition, a safe return could be secured by vowing to give a feast to the Dancing Pipe. In the Medicine Bundle that went with it, were the skins of animals and birds. The otter and lynx were the largest, the otter belonging to the head man and the lynx to the woman. The South Man also told Elk Tongue that, it had been their custom, in giving the Pipe ceremonial, to cut open a badger, and to place inside a preparation mixed with paint. Everyone who attended the ceremonial looked into the badger, trying to see themselves. If their reflection looked black, or wrinkled, it was a sign of death, but, if they looked gray haired, they would live to be old. The South Man advised discontinuing this part of the ceremonial, saying it was not well to try to read the future, because people were made unhappy by it. When the Pipe was unrolled, it was shaken, and, if any of the skins, or feathers fell, misfortune would be sure to overtake the man who made the vow. ” I have followed the Old North Trail so often, that I know every mountain stream and river far to the south, as well as towards the distant north. We call the Three Tetons in the the south (Wyoming), Teat Buttes, because of their shape. North of the Mud Head Creek is a stream along whose banks many berries grow, so we named it Sweet Creek. North of it is another stream we call the Ghost Piskun 1 Creek. On its shore is a miniature cliff about three feet high. At the base of the cliff are small circles of stones, similar to those made by the Indians for their lodge fires. It looks to us as if, at one time, there must have been a miniature Indian camp there. If you visit the place early in the morning you will see many mice. We believe these mice are the ghosts of buffalo, which take the forms of mice, whenever people look at them. North of the Ghost Piskun Creek is a place called ‘ Where-war-parties-meet.’ Many years ago, a Blackfoot war party was traveling north by the Old Trail. The chiefs name was Koko-nut-stoke (Owl), so called because of his large eyes. One day, when Owl was in advance of the others, he discovered a war party of Crow Indians coming south by the same trail. Owl ambushed himself in a thicket. The Crow war party had secured plunder and the chief was in advance, carrying in his arms the sacrifices he was about to make to the Sun. “There is a high peak in the Rockies, where this river rises, which we call Crow Lodge Mountain, because it is the home for enormous flocks of crows. They gather every evening, and roost in the trees on the mountain side during the night, but they always leave in the morning. An Indian secured there the dream for the Crow Lodge, and we have given the river the same name, because he made the lodge in a ravine, not far from this camp. A short distance up the river, is a high cliff, called the Women’s Piskun. It is the place where a large band of women once camped. « Life. It is what’s for dinner.